Let me begin by saying that this is a very simple soup. Simple to make and simple in its choice of ingredients. But the flavours of broccoli, complemented by the fresh aroma and taste of pepper stand out. It is also quite addictive. Ever since I made this some time ago, I have made it many times more. It’s a wonderful way to add greens to your diet. Add a salad and some bread and you have a perfect, simple and uncomplicated meal. This member of the cabbage family is packed with calcium, iron, thiamin, riboflavin, potassium and vitamin A & C. No wonder parents in the west force their children into eating it. And no wonder Broccoli consumption has increased all over the world in the recent past, thanks to its acknowledgement by the medical fraternity as a vegetable containing cancer-fighting properties. Whenever I’m out on a vegetable buying spree, I’m sure to buy broccoli if I spot it. I use it in stir-fries, bakes or simply steamed and sauteed with butter and pepper. Now I’m happy to add this chunky soup to my list of Broccoli Recipes. Simple yet exotic, its hearty, warm and robust flavours are sure to make one happy! 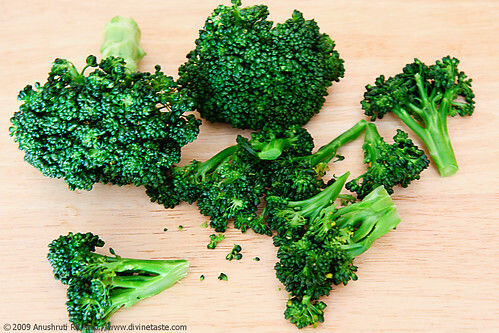 Select Broccoli heads, which are tight and dark green in colour, without a trace of yellow. Good quality milk and butter increase the flavours and taste of the soup. Wash the broccoli in a running stream of water. Chop the broccoli really fine along with the tender stems. Discard the hard and woody portions of the stems. A mezzaluna does a great job here and if you dont have one, use any simple chopping knife. In a saucepan, bring 1 cup of water to a boil and add the broccoli. Cook for 2 to 3 minutes until just tender, keeping the green colour of the broccoli intact. Keep aside, uncovered. Heat the butter on a medium flame in a saucepan and when it melts stir in the flour and cook until the butter-flour mixture changes into a nice light brown colour. Lower the flame and while stirring the mixture with one hand, pour in the milk. Continue stirring to prevent the formation of lumps. Raise the heat to medium and bring to a boil cook for 2 to 3 minutes and stir in the broccoli with the cooking water and bring to a boil again. Continue cooking until the mixture thickens for about 3 to 4 minutes. Add salt and pepper. Put the grated cheese in individual bowls (about 2 tbsp per bowl) and serve hot with some bread. Yay! I have a broccoli in my vegetable basket! Questions… what is plain flour? What's tht interesting knife? 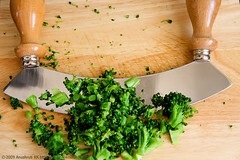 How finely chopped (broccoli)? Simi: Plain flour is maida. The chopping blade featured in the picture above is the mezzaluna. I had picked it up in Zurich I think, but it is available in India now. I think Optima makes it. Chop Broccoli as finely as you can and keep some chunks of the tender stems. I like my broccolis only ray or just steamed. However ur pictures do look really really tempting:-) does not look like broccoli at all! 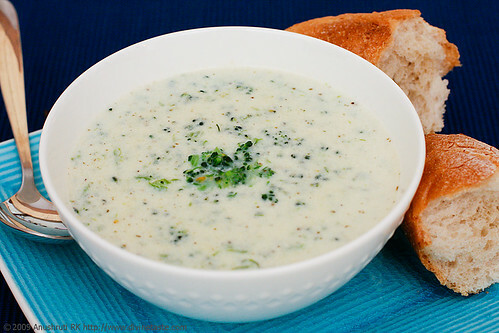 The broccoli soup looks delicious. Thank you very much for sharing this wonderfully simple recipe. I had some brocoli that needed eating & wanted to try something new. This recipe was just the trick. Lovely and creamy, & no flash ingredients to take away protagonism from the brocoli. I made it for tea. Excellent, I will definately make it again (and I think Mr. hopes I will too). looks so yum..belies its healthy properties.. I tried this soup yesterday. My whole family loved it. Thanks to your recipe. Love your blog. Waiting to try more recipes form your blog. Best wishes. I first stumbled onto this site while looking for an eggless recepie and came upon the chocolate custard (which turned out pretty good inspite of me). It was also the first time I actually used a recepie off the web. Since then I have visited this blog frequently and read and enjoyed both the recepies and the lovely pictures, although this only the second other thing that I have tried my hand at! I am always looking for recepies that are quick and wholesome and can be made into pretty much a full meal specially since I am usually rushed. I think this is great effort and congrats on this wonderful endeavour! Shruti: Its wonderful that this worked for you. Thank you for taking the time to write here. Mitali: Ya sure….will add your request to my pending recipe request list. Hope you will be patient. Thanks. I would like to know your other Broccoli recipies… specially the simple ones. How do we make broccoli appealing to young kids. i have a 5 year and a 2 year old. cathy: Sure, will try and put them up. But there are a lot of recipes here where you can substitute broccoli. Try substituting broccoli in the Cauliflower Green Curry.. Loved the soup…just added some minced garlic before adding flour! I tried it , it was truly yummy! I m sure to make this often..
Ashwini: Glad you enjoyed it..we love it too..its a staple for us! I tried adding a boiled and mashed sweet potato instead of flower. Tastes great. Sorry I am writing all these comments today as I didn't get chance earlier!